VPN technology have been somewhat ubiquitous over the past years. Today, there are hundreds of VPN providers offering the same services, such as having unlimited access to VPN, multiple servers across many countries, ability to change location and unblock geo-restricted video content, for somewhat similar prices. If you are a VPN user or have tried and compared between various VPN services, you may find that the differentiating factor for a good VPN is usually in one key thing - speed. If speed is at the center of a worthy VPN, which is is the fastest VPN for iPhone? In this article, we will compare between top VPN providers in the area of VPN speeds, including our very own VPN Proxy, to find out which is the fastest VPN for iPhone. What does it take to be considered the Fastest VPN for iPhone? The judging criteria of the fastest VPN must be very carefully selected to ensure a fair comparisom between VPN services. As a disclaimer, you should know that there not be a single fastest VPN out there, for the reason that a single VPN service will consist of multiple worldwide servers, and each server may have a particular performance in terms of speed. Therefore, our contest of fastest VPN for iPhone uses the methodology of comparing only USA servers from USA East Region. VPN speeds are traditionally different to measure and compare, but we will put the VPN services through a series of tests. Our choice of fastest VPN can be nothing short of lightning fast, as no one likes a slowed experience. Before we get to the actual VPN speed test and VPN speed comparison to find out the fastest VPN for iPhone, it is necessary to understand how VPN works first, in order to gain an appreciation for VPN services and VPN speed. A VPN service essentially creates a connection between your device and your location to a server residing in another physical location in the world. Therefore, the VPN server actually acts as a bridge between your device and the app or website you are trying to access. Why does it slow things down then? Does this happen even to the fastest VPN for iPhone? If you are thinking to yourself, "Oh, that may be because the VPN acts as a external party or router to handle traffic and data transmission between your device and your site"- you are absolutely correct here. However, the term you might be looking for is "Proxy" or "Proxy server", where a VPN server would help to fetch and request, and obtain data on your behalf. The data now flows from your website to the VPN service first instead of directly to your device. That may result in a slightly slower experience, but this brings you all benefits of a VPN like anonymity, personal privacy and security, and getting the ability to change your location as you like. For this comparison for fastest VPN for iPhone, we have very carefully picked few of the most popular VPN services out there- Hotspot shield and Nord VPN, to them put up against our own VPN Proxy for iPhone (that is especially built and optimized for incredible speed). In this speed comparison to find out the fastest VPN for iPhone, we will compare four areas of VPN speed. First, we will compare the time taken to connect to VPN between the providers. The second test of using Speedtest.net offers a fast and unbiased way to find out exactly how fast the connection you have is running at. As for third test using the test file, we have uploaded a test file of about 100MB to a central location on the internet for downloading using the 3 VPN iPhone apps. The last step tests for a very important thing needed by most VPN users, which is the loading speeds for videos such as Youtube or Netflix. We will find out below. In all three VPN providers, we connected to the same server location (USA East) from the west coast of USA. VPN Proxy came in slightly faster than the other two providers. Time is measured from the point we tap on 'Connect', until the VPN connect badge appears at the top of the iPhone's navigation bar. For each VPN provider we take an average of 20 passes to arrive at the final time taken to connect to VPN. Our second test is a speed test using a third party speed test site speedtest.net. Nord VPN Hotspot shield showed noticeably highest upload and download speeds, but VPN Proxy offered the lowest latency below 200ms. You may notice two things- 1. that Hotspot Shield has a higher download bandwidth than VPN Proxy, and 2. Nord VPN has a WAY higher upload bandwidth than VPN proxy. What does this mean in terms of the fastest VPN for iPhone? However, bandwidth is just one element of what a person perceives as the speed of a network. People often mistake bandwidth with internet speed mainly because internet service providers (ISPs) claim they have a fast ‘50Mbps connection’ in their advertising campaigns. True internet speed is actually the amount of data you receive every second and that has a lot to do with latency too. In this test, we try to download a file that is around 100MB large while VPN is connected and measure the time taken for the file to be completely downloaded. The fastest VPN for iPhone should be able to complete downloading the file pretty quickly. As download speeds are also dependent on the server servicing the actual file, we took an average of 10 passes to get a final value. Time is measured from the time from video is tapped on, to the point the video is completely downloaded as visually seen in the download bar. You may think it is a shameless plug to feature our own VPN Proxy app for iOS here in the test to find out the fastest VPN for iPhone, but we have a good reason for doing that. 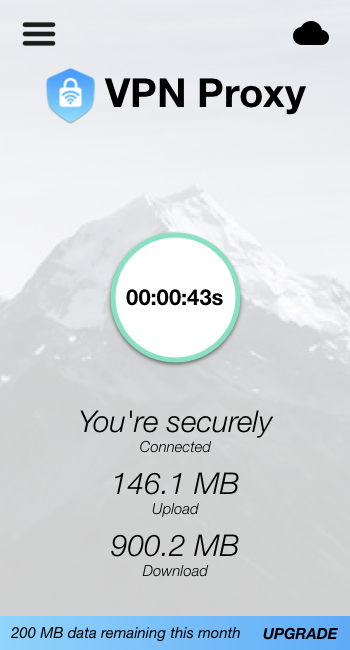 Our VPN is designed to be lightning fast, and completely optimized for iPhone. Compared to other top VPN providers, VPN Proxy ranks at the top in terms of VPN speed in almost every speed test. VPN Proxy by Appsverse gives you, unlimited access to anything on the internet, with complete set of privacy features you can completely test to protect your personal privacy. We will highly recommend it if you are looking for a lightning fast VPN for iPhone.